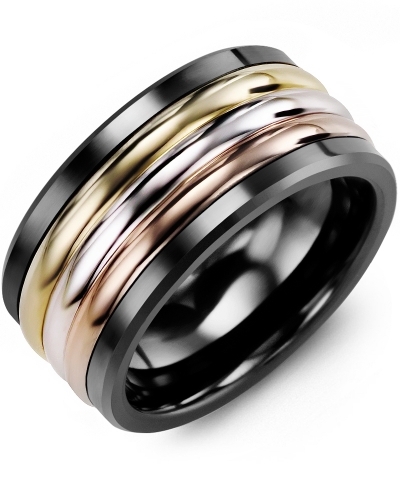 MJH - Three Color Gold Men's Ring Combining the beauty of all three gold colors, this Cobalt ring, Tungsten ring, or Ceramic ring is a truly unique and eye-catching piece of jewelery. The 11mm band contains three inserts; one yellow gold, one white gold and one rose gold. Available in a range of Karat options – 10kt, 14kt and 18kt. We are also able to engrave the inside of the ring, for a more personal gift or wedding band. Combining the beauty of all three gold colors, this Cobalt ring, Tungsten ring, or Ceramic ring is a truly unique and eye-catching piece of jewelery. The 11mm band contains three inserts; one yellow gold, one white gold and one rose gold. Available in a range of Karat options – 10kt, 14kt and 18kt. We are also able to engrave the inside of the ring, for a more personal gift or wedding band.